Why Sod? And Why Are Synthetics Bad for the Environment? Thinking about going synthetic??? Think again! Natural turfgrass sod is BENEFICIAL to the environment! Just remember to water wisely, choose the correct variety for your area and use,and follow maintenance guidelines. Instantaneous beauty and immediate value with sod. Within just a few hours, sod transforms bare soil into a lush and beautiful carpet of grass. Landscaping with turfgrass from a top quality sod farm in California immediately increases the market value of property from 10-15%! Sod creates a healthy environment. Sod cleans the air and helps recharge our groundwater supplies. Turfgrass is one of nature's finest and least expensive filters, and works to improve the environment. Sod reduces heat, glare, and noise. On a hot summer day, a home lawn will be 30 degrees cooler than asphalt & 15 degrees cooler than bare soil. The front lawns of 8 homes have the cooling effect in hot weather of about 70 tons of air conditioning. Our sod is grown by West Coast Turf at a top quality sod farm providing you an Instant Lawn. Sod will root down in about 10 days and can be ready for rough play within weeks. A seeded lawn cannot be used for months and will not stop the soil or seed from washing or blowing away. Sod can also be installed any time. And what about synthetic turf?? Don't be "greenwashed" by the false claims of the synthetic turf industry. If it sounds too good to be true, it most likely is! Ground rubber tires are used in some artificial fields, yet because of their toxic content they are prohibited from being disposed of in landfills or ocean dumping. Where will this toxic material be disposed when a replacement field becomes necessary? Temperatures on artificial fields have been documented to be upwards of 86.5 degrees hotter than natural grass fields under identical conditions. How long can players of all ages be safely exposed to this level of heat? Field sanitation that includes the removal of bodily fluids and/or animal droppings present a unique problem for artificial fields. Will antiseptic cleaners properly sanitize field? If so, how often? Abrasive surfaces such as artificial fields can result in difficult-to-heal injuries, particularly in the presence of bacterial or viral pathogens. Are you prepared to treat these wounds properly? Field hardness on artificial surfaces can result in serious chronic or immediate athletic injury? If additional ground tire rubber is periodically added to soften the field, is toxicity of the material also renewed? Natural turf is preferred by 88% of NFL players, and 96% believe that artificial turf contributes to injuries. Natural turfgrass saves energy. The front lawns of eight houses have the cooling effect of about 70 tons of air conditioning. That's amazing when the average home has an air conditioner with just a three or four ton capacity. Green turfgrass significantly lowers fire hazard risk. How would an artificial turf field fire be fought quickly while minimizing the danger to fire fighters, and reducing the release of toxic fumes? The initial price of artificial turf is many times greater than a natural turf area. Maintenance costs are equal or higher. Think Green-Keep it Real! 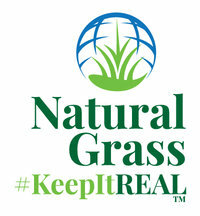 Check out more #KeepItReal updates on Twitter. Can Playing on Artificial Turf Kill You? NBC News Coverage of the debate taking place at the ballot box in San Francisco. Go to www.synturf.org for all current up to date info! Source: "Synthetic Surface Heath Studies," C. Frank Williams and Gilbert E. Pulley, Sports Turf Managers Association Annual Conference, January 2004.